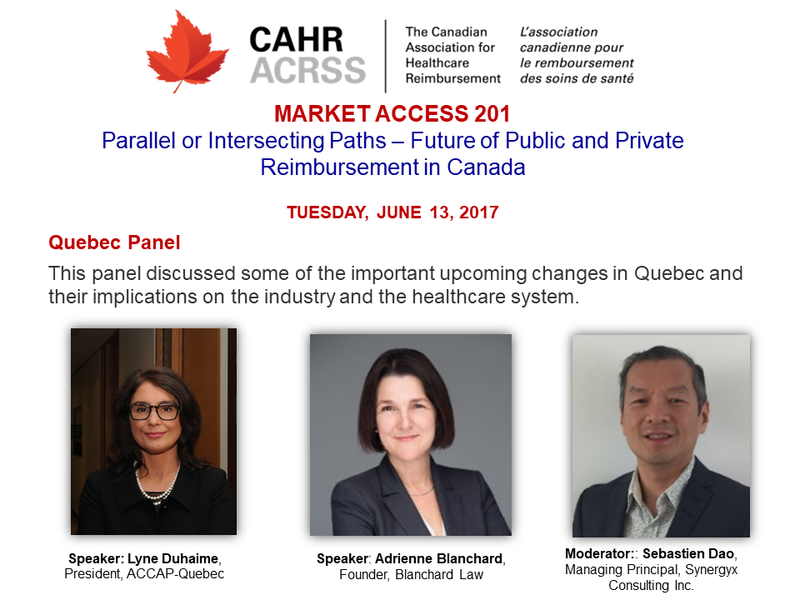 On Tuesday, June 13, 2017, the Canadian Association for Healthcare Reimbursement (CAHR) held the Market Access 201 conference in Toronto. The theme for this conference was Parallel or Intersecting Paths, the Future of Public and Private Reimbursement in Canada which consisted of five fascinating panels focusing on key topics of interest to the Canadian pharmaceutical stakeholders. Over the coming weeks, MORSE will be releasing summaries for each panel to share key learnings from this conference. This issue will focus on the Quebec panel discussion. Description: A number of important changes are emerging in Quebec over the coming months (e.g. INESSS will be changing its framework for evaluation and issuing guidelines on biosimilars). In addition the implementation of Bill 92 will restrict the use of co-pay cards which may have significant impact on patient assistance programs in that province. This panel discussed the upcoming changes in Quebec and their implications on the industry and the healthcare system. Sebastien Dao, Managing Principal, Synergyx Consulting Inc.
We did extend invitations to individuals to the government but they are working on new regulations including new amendments on Bill 92 which will come out at the end of the month. And new bills the Minister will present. INESSS is also very busy working on new guidelines. They did publish some new guidelines 2 weeks ago as well. 20 years later how are they performing…. Legal update on Quebec’s Bill 92 which amends six different acts and affects many players. The Bill became law in December 2016 which broad ranging amendments to the Act. Originally thought it was aimed at cards, but the stated purpose is to increase transparency, competition and reduce costs. An intermediary has two parts to the definition including banners and chain drug stores. This imposes obligations on any person who intervenes on the supply chain or marketing which is a very broad definition. I have not been able to get clarity on who is scoped in that definition. The new section of the act has a series of prohibitions for dealings within the supply chain such as a manufacturer cannot enter an exclusive supply deal and that provision is in force. You also can’t pay or reimburse a person covered under the public plan. This could affect co-pay cards and patient support programs however, this is not in force. Humanitarian payments may occur but the definition is not clear. It is also prohibited to limit supply to a restricted number of pharmacies unless allowed by Health Canada. Cannot discriminate in supplying to pharmacists. You cannot have an exclusive agreement with pharmacy but can have preferential. It is prohibited for manufacturers, wholesalers or intermediaries to directly or indirectly receive benefit, discount or additional profit margin. There are no add on benefits it is just the sale price and this in force. It prevents a manufacturer from providing benefits of an author of a prescription or a senior resident manager. However, what is the definition of a benefit? If a physician is infusing a drug then if they are paid is that a benefit? Provision regarding several questions surrounding patient support programs. There are also new powers of the Minister and he can delist products from the list. In Quebec, we have a universal plan. Drug costs continue to increase in Canada but in Quebec there are different elements. More prescriptions, low use of generics, no agreements with pharma, no agreement with pharmacists. The reality is in Quebec as an employer the plan must cover prescription drugs and all drugs on the formulary must be covered. Those employees will get more prescriptions than in other provinces. Drugs are expensive and as a private payer you need to pay the price on the list. Pharmacists are charging more to private payers. The difference is about $450 million per year to compensate for what the pharmacists believe that the government fees are not sufficient. Bill 92 will be helpful… As of September 15, 2017, the pharmacist will have to list on the invoice the professional fees, the drug cost and the wholesale profit margin. The professional fee is the dispensing fee, the margin. Important to private payers, which means employers and employees, and it does not mean the price is less but there will be a tool to try and control prices. They are still in a battle with pharmacists; 2017 is a pivotal year as a breach in the deadlock. There are tools to inform patients about the costs of the drug and differences between pharmacies. Before October the Minister of Health must publish a report that determines the difference between public and private plans. In 2013 the difference was about 17% and this report will be filed this fall. Really want to use this opportunity to change things and be more comparable to what happens outside of Quebec. Hopeful that the situation will improve. What is the communication plan to talk to consumers about the change that will occur in September and what kind of push back do you expect? LD: We developed communication tools for our members. We are working with members and preparing the communication tools and will also work with the media. This will be very important since the public will have questions. Some CLHIA members are negotiating with pharmaceutical companies, how do they plan to work to harmonize the process? LD: The key message is to join the pCPA and in terms of drugs we are partners of governments. MORSE thanks our Reimbursement Strategist, Avery Hughes, for diligently preparing these summary notes during the conference. This summary is not an official transcript of the presentations/ discussions – as such, it may contain some errors/omissions/misinterpretations. Please contact the CLHIA, Adrienne Blanchard or Sebastien Dao if you would like additional information or clarification on this topic.